We have a landing page that will permanently list the latest deals for Vitamix and Blendtec, including holidays like Black Friday, Cyber Monday, and Christmas. You can find it here. If you’ve been waiting for a special deal to buy your Vitamix or Blendtec, Black Friday through Cyber Monday is your time to act. Vitamix and Blendtec are kicking off the 2014 holiday shopping season, starting on Black Friday with deals extending through Cyber Monday. 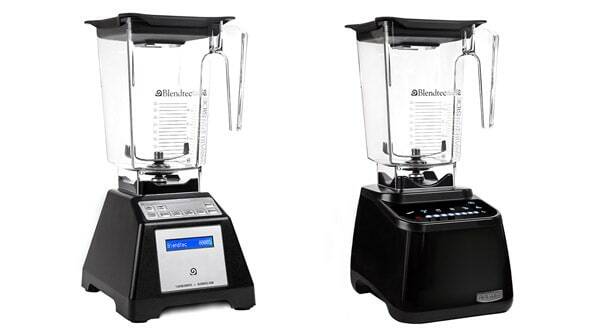 These special prices and promotions are only slated to run for a limited time and the availability of all refurbished blenders is limited, so you’ll need to move quickly if you want to take advantage. It’s rare for these companies to offer discounts on their blenders, but Black Friday through Cyber Monday is one of these times. Below, let’s take a look at what each is offering and let you know how to get the best deals. Note: Cyber Monday pricing has ended for Blendtec and Vitamix with the exception of the Certified Reconditioned Two Speed for $259. For this year’s Black Friday sale, you can pick up an extra Vitamix container for just $50 when you purchase a 5200 Standard – Getting Started package. Whether you’re looking to get a dry grains container for making flour, a 32 or 48 ounce container for smaller portions, or a spare 64 ounce container for extra batches, $50 is an excellent deal. Savings will range between $79-$99 depending on the container you choose. While supplies last, Vitamix has dropped prices on several models from their Certified Reconditioned lineup. You won’t need to enter any additional promotion or coupon codes to receive this special pricing, but using our Vitamix promotion code, you will automatically apply an additional free shipping discount to your order (a savings of $25 US / $35 CA). Blendtec is also offering some pretty attractive deals for Black Friday through Cyber Monday this year on their Certified Refurbished packages. These deals will run through Cyber Monday (December 1st) and only while supplies last. Once again, no special promotion codes are necessary to receive this special pricing, and free shipping will automatically be applied to your order if you shop on Blendtec.com by using any of the links on our site. I’m so happy to see that Vitamix is having a sale for Black Friday. I’ve been holding off on purchasing in hopes that the price would drop and I was right. I can’t wait to start making my own healthy soups! So excited! Can’t wait to get my new Blendtec blender.